Early flowering forms of lavender with compact habits and aromatic grey foliage. Emerging from early winter, purple coloured lavender flower heads provide a lively display for what can be a dreary time in garden landscapes. L. 'Violet Lace' offers flowers of an intense deep purple colour whereas L. 'Lavender Lace' is at the other end of the spectrum in soft shades of lilac. Middle ground is where you will find the colourings of V. 'Winter Lace' whose fragrant flower heads are crowned with ruffled, mid lilac coloured bracts that soften with age giving a delightful dappled effect. Lavandula (the name of this genus) is derived from the latin word lavare which means 'to wash' in recognition of its common use since Roman times in soaps and various toiletries. In Elizabethan times laundresses were referred to as 'lavendres' due to their use of lavender-scented water to impart the herbs fresh scent through their washing. Over the centuries a host of ailments were sought to be cured through various applications and preparations involving the use of lavender. Today this amazing plant continues to delight gardeners with its soothing scent, drought tolerance, ease of care and range of uses whether in the garden or dried for floral crafts. Lavender stoechas makes reference to where it originated, the Islands of Stoechades, off the coast of France in the Mediterrranean, renamed since as the Iles de Hyeres. Dry tolerant once established it makes a particularly good choice for the water-wise gardener. Ideal for either cottage or formal style gardens where individual plants can add permanent structure or a row planting can be clipped to form an informal hedge. Can be grown in larger sized containers. 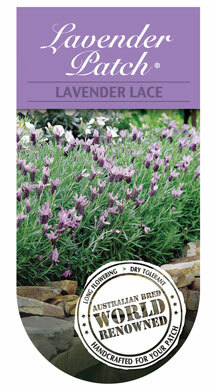 Ideal for adding a country touch to vegie patches and certainly at home in herb or potager gardens. If using for hedging space plants around 50cm apart at planting. Plant Partners: Plants which require similar growing conditions which are also complementary include: Roses, Daylilies, Salvias, Gauras, Irises, Scabiosa, Achillea, Penstemon, Diascia, perennial Nemesias. The varying shades of violet in the lavender Lace series is equally at ease mingled with soft romantic shades of pastel pinks and blues as well as it can be incorporated at the other end of the mix into a lively mix of vibrant pinks, yellows and oranges. Your taste - your choice! 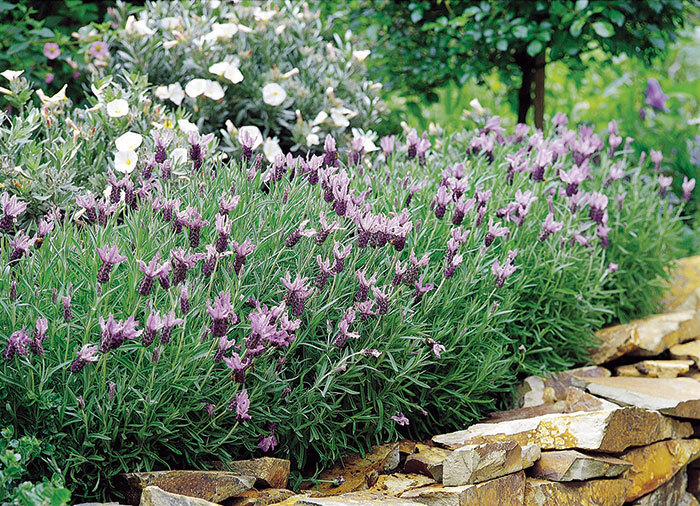 Use broader leafed plants around your lavenders to highlight the textural differences. Adding other silver foliaged plants, or those with plum or burgandy coloured leaves to your landscape can produce some delightful results. Plant in full sun in well drained soil. A light prune after flowering will encourage bushiness and new flower growth for the next season. An application of a slow release fertiliser at this time would also be beneficial.